Tubular piling can be supplied in open end or closed end with a piling shoe. If in open end,the sand and soils will come out through the pipe inside. We can supply tubular pilings with various piling shoes. Depending on the structure, load and soil conditions you are working with, you may use open or closed ended pipe piles. The main tubular piling standard is API 5L and EN 10219-1.Piling pipe and piling tubes steel grade from grade B,X42,X46,X52,X56,X60,X65 up to X70, and X80.Pipe and piling standard in EN 10219-1 has S235JRH, S275JOH/J2H, S355JOH/JEH S420MN, S460MH steel grades. Pipe piling are steel pipe piles that are used as steel piling purpose,for example,deep foundation,port constructions etc. Pipe piling take pressures from soils,waters,sands from one side to make use the projects on the other side can go ahead. Pipe piling are also called pipe piles,tubular piles, or tubular pilings.Although we can produce the pipe piles in almost any diameter and thickness,the projects almost all require big diameter pipes. We can supply in 100m per single length,or we can also supply in shorter length and clients can splice and welding at job sites. Pipe piles are almost all spiral pipes due to dimension and economical considerations. Spiral pipes can reach 3000mm diameter easily,which means bigger modulus of sections and bending moment. The main tubular piling standard is API 5L and EN 10219-1.Piling pipe and piling tubes steel grade from grade B,X42,X46,X52,X56,X60,X65 up to X70, and X80. API is petroleum standard,so very strict requirements. Compared with wood or concrete construction,pipe piles are high speed installation,lower in total costs, and also friendly to environment. Tubular piling can be supplied in open end or closed end with a piling shoe. If in open end,the sand and soils will come out through the pipe inside.We can supply tubular pilings with various piling shoes. Depending on the structure, load and soil conditions you are working with, you may use open or closed ended pipe piles. Tubular piling can be retaining elements for horizontal loads from soil and water pressures as bearing piles for vertical loads. 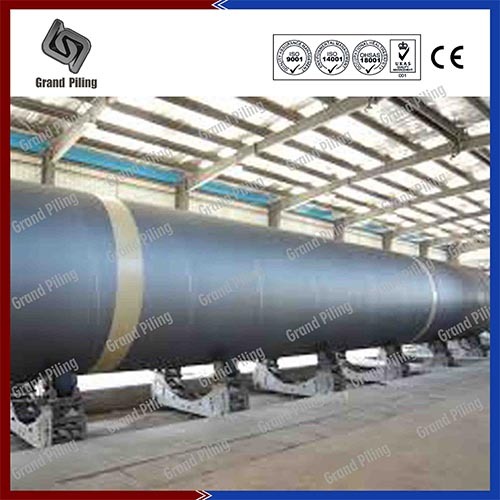 Pipe and piling standard in EN 10219-1 has S235JRH, S275JOH/J2H, S355JOH/JEH S420MN, S460MH steel grades. Tubular piles can also be used a foundation piles when soil and ground conditions are not suitable to support the structure.In deep foundation,steel piles can transfer the structure load to rock formations or to stronger soil conditions deep beneath the ground. With various sizes, strengths and grades available, you can find the ideal steel pipe piling for your needs. Our welders are AWS D1.1 certified to accommodate most marine piling, bridge piling or building pile requirements.Pipe piling can be connected with sheet piles to form combined walls or combiwall. The intermediate sheet piles transfer horizontal loads to the pipes. Intermediate sheet piles can be shorter than the pipes. Our clients are a wide variety of contractors, including building contractors, marine contractors, bridge contractors and more.